The Vertical KM race of the Cordillera Mountain Ultra on March 4 is a fast paced adrenaline pumping race up 1000m of elevation gain in just 5 kilometers! 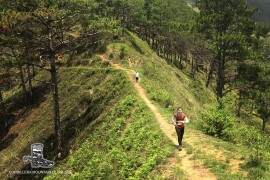 This is the pre-race warm up for the big 50km Cordillera Mountain Ultra on March 5! It is a short race in comparison to many of the trail races around Asia but this is likely the most exciting trail race out there, not to mention having the most picturesque finish line. Competitors are all tongues out and neck and neck from the starting line to the finish line at the top of the mountain and with just 5 kilometers there is no let up! You have to go all out all the way! Burn your lungs, burn your legs, use your hands, use every calorie you can supply! This is the Vertical KM! Registration for the Cordillera Mountain Ultra starts on November 21, 2016 Stats: Distance: 5.52kms Elevation Gain 1019m D+ Elevation loss: 55m D- Maximum Incline: 55.2% Average Incline: 21.3% You can run long, but can you run FAST UP this Hill?